I know I haven’t posted for a while and it has a lot to do with what is happening in Venezuela. It’s inevitable, it’s my country, and I have family and friends living there. So, yes, I had like a blogger’s block and wasn’t inspired at all. Nevertheless, life goes on, and I cannot let a situation that I cannot solve, keeping me away from my blog. So I decided to post telling you all about a quite pleasant experience I had with La Prairie at Neiman Marcus Coral Gables. This is NOT a sponsored post; I just wanted to share with you a wonderful experience I had in the middle of a crazy week with a brand I didn’t try before. La Prairie and Neiman Marcus invited me to an exclusive facial and to enjoy some bites and champagne. The event took place during SWIMIAMI, so it was quite a suitable break in the middle of multiple runway shows and special events. After this facial, my skin looked prepared for makeup with restored radiance and no signs of my lack of sleep. 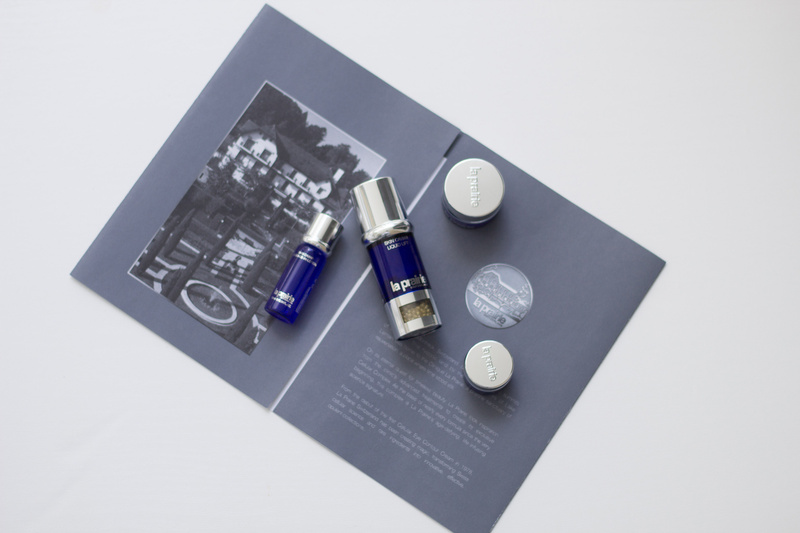 Magda, La Prairie Specialist was in charge of revitalizing my skin. She’s a professionally certified esthetician passionate with what she does and a very sweet lady. You probably know how beautiful and calm Neiman Marcus Spa cabins are, so it was the perfect break for such an active week. I must confess I’ve never tried La Prairie before, mainly because I knew it was expensive and I didn’t think it would be that different from other fantastic beauty brands. On the other hand, I have very good skin, and I’ve also taken good care of it since I was in my twenties. Magda started cleaning my face (which only had sunscreen) with La Prairie exquisite foaming cleanser. Then she used the tonic and asked me which one I used. I’ve always used Rose Water, as my mother and grandmother used it with excellent results. Magda agreed that Rose Water is a very good choice and she recommended me to keep using it. I appreciated her insight because she’s a professional esthetician that gave me an honest opinion. She then applied the 3-minute cellular peel and explained that its formula is a mix of AHAs (Alpha Hydroxy Acid) and BHAs (Beta Hydroxy Acid), salicylic acid and mixed fruit acids, which helps to rid skin of surface debris. It serves as a weekly booster to help renew, refresh and revitalize skin. It is very gentle and should be used once a week. Then, Magda applied the Swiss White Cellular Intensive Illuminating mask with a gorgeous massage. It is a 2-phase infusion mask that saturates skin with moisture and provides intensive whitening, brightening and calming benefits. It is amazing to whiten your dark spots and restore radiance. After that, Magda asked me about my skin concerns, which are mainly some elasticity loss and eye-bags, which by the way were pretty bad that specific day. Thus, she treated my eye-area with the Cellular Eye Essence from the platinum collection. She showed me how much should I apply any eye care cream as well as the best way to do it. The amount of eye-cream is like a rice grain, no more than that, especially if they’re concentrated. Honestly, I was impressed by its effects, because I also have dark circles and I saw how this essence helped to lighten them. I can’t tell you how many eye-serums, creams, masks and treatments I’ve tried, so far, nothing compares to this. After the facial, she applied the products she considered more appropriate for my skin from the Skin Caviar Collection, and also explained to me the benefits of each. I could only buy one, so she told me that the best investment would be the Concentre Liftant Dermo Caviar because it provides the skin with an instant lifting effect and helps restore skin’s firmness with its regular use. Honestly, after using this lotion twice a day for the last couple of weeks, I’ve seen a real improvement in my complexion. So it was worth the investment. I also received a travel kit with the entire Caviar Collection, and obviously, I’ve been using it since then, sparingly though! But that wasn’t all. After the facial, I had a manicure with Deborah Lippman products while enjoying champagne. So I left Neiman Marcus completely ready to get home, do my makeup and continue with SWIMMIAMI. What about you? Have you tried La Prairie? Would you? You all know how much I appreciate your comments!